Daunte Rachard Culpepper (born January 28, 1977) is a former American football quarterback. He last played for the Sacramento Mountain Lions of the United Football League (UFL). Prior to joining the UFL, Culpepper enjoyed a successful National Football League (NFL) career after being drafted 11th overall in the 1999 NFL Draft by the Minnesota Vikings. He played college football at the University of Central Florida. A three-time Pro Bowl selection with the Vikings, Culpepper had a historic 2004 season in which he set a single-season record, since broken, for the most total yardage produced by a quarterback in NFL history (5,123). However, Culpepper suffered a serious knee injury the following season that ended his Vikings career. After that, he played sparingly in the NFL for the Miami Dolphins, Oakland Raiders, and Detroit Lions. Culpepper ranks 14th all-time in NFL career passer rating (87.8) and holds the seventh best single-season passer rating from his 2004 season (110.9). Outside of football, Culpepper has worked with the African American Adoption Agency. He hosts an annual Daunte Culpepper AAAA Celebrity Golf Tournament fundraiser, and has also served as a keynote speaker at the United Way Reason To Be Thankful celebration. Culpepper was born to a single mother, Barbara Henderson, who is the sister of former NFL linebacker Thomas "Hollywood" Henderson. While his mother was pregnant with him, she was serving time for armed robbery. Culpepper was adopted when he was a day old and raised as one of more than 15 children of the late Emma Lewis Culpepper, who worked in the correctional facility where his mother was held. They lived in Ocala, Florida, where Culpepper attended Vanguard High School. He played football, coached by Alex Castaneda, one of five finalists for the 2000 NFL High School Football Coach of the Year Award, as well as basketball and baseball. After his senior season in 1996, he was named Mr. Football in the state of Florida. In 2007, Culpepper was named to the FHSAA's All-Century Team that listed the top 33 football players in the state of Florida's 100-year history of high school football. Culpepper was drafted eleventh overall in the first round of the 1999 NFL Draft by the Minnesota Vikings; he was the fourth quarterback chosen, after Tim Couch (1st overall), Donovan McNabb (2nd) and Akili Smith (3rd). In his first year Culpepper saw limited playing time and did not throw a pass. In 2000 he was named Minnesota's starting quarterback. He led the Vikings to victory in the first seven games of the season, and helped them finish 11–5 and advance to the NFC Championship game, where they were blown out by the New York Giants 41–0. During the season, Culpepper passed for 3,937 yards, 33 touchdowns and 16 interceptions. He also rushed for 470 yards and seven touchdowns. One of Culpepper's most notable moments was against the Buffalo Bills when he threw a pass across his body and the field to Randy Moss for a 39-yard touchdown pass, although the pass was at least 60 total yards. At the end of the year he was selected to his first Pro Bowl. Randy Moss, wide receiver for the Vikings, said that Culpepper was one of the most talented quarterbacks he has ever seen following the 2000 season. Culpepper struggled over the next two seasons beginning in 2001 throwing 14 touchdowns to 13 interceptions. The Vikings finished the season 5–11. Culpepper started all 11 games in which he appeared, missing the final five games of the season with a knee injury he suffered in a game against the Pittsburgh Steelers on December 2. He completed 60 percent of his passes or better in nine of his 11 outings, including twice when he surpassed the 70.0 mark and had a passer rating of 100.0 better in two contests where the Vikings were 1–1 in those games. Culpepper’s rushing total ranked third among NFL QBs, trailing only Pittsburgh’s Kordell Stewart (537) and Philadelphia’s Donovan McNabb (482). Culpepper continued to struggle in 2002, throwing 18 touchdowns to 23 interceptions and leading the Vikings to a 6–10 record. Some attribute this to his appearance on the cover of the Madden NFL 2002 video game, where he subsequently proceeded to have the worst year of his career until 2005, keeping with the superstition of the "Madden Curse". Culpepper went on to win the EA Sports Madden Bowl title among NFL players during the 2003 offseason. His ten rushing scores led all NFL QBs in 2002, and also marked the sixth-highest total by a QB in NFL history trailing only Cam Newton (14 for Carolina in 2011), Steve Grogan (12 for New England in 1976), Johnny Lujack (11 for Chicago in 1950), Tobin Rote (11 for Green Bay in 1956) and Kordell Stewart (11 for Pittsburgh in 1997). Culpepper made a comeback in 2003, leading the Vikings to a 9–7 record, although they missed the playoffs. He passed for 3,479 yards, 25 touchdowns, and only 11 interceptions, and earned his second trip to the Pro Bowl. Another notable moment occurred in this campaign, when in the 20–16 comeback win over the Tampa Bay Buccaneers, Culpepper ran the ball in for an 8-yard score. On the run, Culpepper barrelled into Derrick Brooks and Shelton Quarles, but was the first player up after the score. Culpepper enjoyed his best statistical season as a professional in 2004 and, though they were only 8–8, the Vikings reached the playoffs for the second time with Culpepper. Passing for a league-leading 4,717 yards, a Viking-record 39 touchdowns, and only 11 interceptions, Culpepper was named to his third career Pro Bowl. Culpepper also broke Dan Marino's NFL record for combined passing and rushing yards, amassing 5,123 total yards. His 2,323 rushing yards from 2000–2004 also made him only the fourth quarterback in NFL history to run for more than 2,300 yards in a five-season period. (Michael Vick had 3,570 from 2002–2006; Randall Cunningham had 3,232 from 1986–1990; and Steve McNair had 2,387 from 1997–2001). Culpepper's career rushing average of 26.1 yards per game is fourth-best among quarterbacks in NFL history. Only Vick (47.3 yds/g), Cunningham (30.6 yds/g), and Bobby Douglass (29.8 yds/g) have averaged more rushing yards per game during their QB careers. After the 2004 season, Culpepper said the game had "slowed down" for him, saying "I feel like a Jedi Knight." His first two games of the 2005 season were disappointments, as the Vikings went 0–2 while Culpepper threw no touchdown passes, eight interceptions, and fumbled twice which many attribute to his relatively small hands. Culpepper rebounded in the third week, throwing for 300 yards and three touchdowns while beating the New Orleans Saints. In 2005 he had six touchdowns, twelve interceptions, and five fumbles before getting injured in the seventh game (only winning two games). On October 30, he suffered a knee injury during a 38–13 loss to the Carolina Panthers. Culpepper sustained damage to three of the four major ligaments in the knee: the ACL, PCL and MCL. He was placed on injured reserve and began rehabilitation treatment near his home in Florida. Backup Brad Johnson took over in the Carolina game and after losing that one, they won the next six straight games and the team ended up with a 9–7 record. Daunte's final career won-loss record as a starter for the Vikings was 37–40 (48.1% winning percentage). Culpepper was in negotiations with Zygi Wilf, the new owner of the Vikings, in regard to his contract with the team. Rumors surfaced that Culpepper was unhappy with his status in Minnesota due to the re-emergence of Brad Johnson following his injury. The Vikings wanted him to rehabilitate in Minnesota because they were not satisfied with his level of treatment in Florida, Culpepper refused this request. Later on, Culpepper expressed his desire to be out of Minnesota. According to the Associated Press, Culpepper said that if he was not traded, he wanted to be released. Culpepper said "because of the fundamental differences I have with management regarding the approach to my personal and professional life, I think it is the best business decision for both parties to go our separate ways." Culpepper was not insistent on being traded to the Miami Dolphins, and orchestrated his trade without the services of his former agent. New Vikings coach Brad Childress likened his dealings with Culpepper to his dealings with Terrell Owens and said he never had a conversation with Daunte that did not involve his contract and getting more money instead of football and the team. Culpepper was traded to Nick Saban's Miami Dolphins in exchange for a second round draft pick. He changed his number from 11 (which he wore in Minnesota, after wearing #12 his rookie season in honor of Randall Cunningham) back to his original number 8, the same number he had at Vanguard High School and the University of Central Florida. He was off to a rocky start in his first two regular-season games, losing both of them with fans booing Culpepper and calling for backup Joey Harrington in the second game. But he had an improved performance in the third game, winning 13–10 over the Tennessee Titans who had the second to last ranked defense in the NFL. However, the next week the Houston Texans with the last ranked defense in the NFL won their first game of the season against the Dolphins. On December 25, 2006, Steve Young appeared as a guest announcer during the Dolphins' second to last game and criticized Culpepper's work ethic. Culpepper saw this on TV from his box suite at Dolphin Stadium and immediately walked down to the ESPN booth and waited for Steve Young to finish, then Daunte confronted Young about it and said he has not missed any meetings and that's not who he is. Young apologized and said though he heard Culpepper had been missing meetings he should have checked with Daunte first before repeating it. After the season coach Saban left for a head coaching job at the University of Alabama. On January 21, 2007 the South Florida Sun-Sentinel reported that despite public assertions by Saban, privately his decision to bench Culpepper actually had little to do with his knee and more to do with his head. In the absence of Culpepper, the Dolphins relied on quarterbacks Cleo Lemon and Gibran Hamdan, untested players with one regular season start between them, in the Dolphins' initial minicamp under first-year coach Cam Cameron. Both the players struggled to move the offense and the poor performance led to an April 15 report that stated a much-discussed trade for Kansas City's Trent Green was imminent, for Culpepper was unable to participate in the minicamp as he continued to recover from knee surgery. The weekend previous to the report, Culpepper revealed that the second surgery, which was designed to address scar tissue in the knee, was more serious than anyone originally divulged, and called for a rehabilitation period of 4–6 months. Culpepper said he has been told by Dr. James Andrews, his surgeon, to "begin to ease into things" after May 1. On June 5, 2007 the Dolphins completed the long-awaited trade for Trent Green; a few hours before the Green trade became official, the Dolphins told Culpepper they "are going in a different direction at the QB position," according to Culpepper, who resisted that plan. On June 7, Culpepper, acting as his own agent, asked to be released from his contract with the Dolphins. The Jacksonville Jaguars led a list of a few teams that were interested in signing him once he was on the free agent market. Culpepper was on the Dolphins' practice field for the start of a weekend minicamp on June 8, one day after asking for his release and two days after Miami completed a trade with Kansas City for Trent Green, who took over at quarterback. When Culpepper left the field and headed into the Dolphins training facility, he walked off the field with a member of the Dolphins security staff. The team did not give an immediate explanation. Informed by quarterbacks coach Terry Shea that he would not be permitted to take part in any team drills during the Dolphins' June 8–10 minicamp, Culpepper stated that he would seek intervention from the NFL Players Association to end the stalemate. In response, Dolphins officials stated they had no intention of releasing Culpepper, and would continue their efforts to trade him. In fact, head coach Cam Cameron told the Miami media on June 9 that the team was "absolutely" prepared to take the situation into training camp as the club attempts to locate a trade partner. After being told he would not be allowed to practice, Culpepper told reporters that he would not restructure his contract to accommodate a trade, and said that he had already spoken to some teams that might be interested in him, such as the Jacksonville Jaguars. He was finally released by the Dolphins on July 17. Culpepper was then rated number 8 in ESPN magazine's 2007 worst quarterback poll. Culpepper was first and most often linked to the Jacksonville Jaguars, but Jaguars head coach Jack Del Rio said he did not feel Culpepper would be a good fit. Culpepper worked out for the Tampa Bay Buccaneers soon after his release, but was not acquired by the team. On July 31, Culpepper inked a one-year contract with the Oakland Raiders, as an insurance policy by the Raiders as they struggled to sign number-one draft pick JaMarcus Russell, with whom they were engaging in contract negotiations. In 2007, Culpepper replaced the injured Josh McCown for the Raiders matchup against his former team, the Miami Dolphins. Culpepper finished the game with two passing and three rushing touchdowns. Culpepper started a total of six games for Oakland until an off-field hamstring injury (suffered when he challenged Oakland CB Stanford Routt, a college sprinter, to a footrace during practice) sidelined him for the remaining portion of the season. Culpepper visited the Green Bay Packers on April 23 and April 24, 2008. He would later turn down the offer from the Packers, $1 million for a one-year contract, claiming the deal was not good. He said he was in contact with a few other teams. In July 2008, it was reported that the Detroit Lions were interested in signing Culpepper, but they never made an offer to him. He worked out with the Pittsburgh Steelers in August 2008, but the Steelers elected to sign Byron Leftwich instead to replace the injured Charlie Batch. On August 29, 2008, Culpepper then changed his mind and stated that he would consider a backup role in Green Bay if they were still interested in him, but the team did not put forth an offer. The Kansas City Chiefs had spoken to Culpepper about coming out of retirement for the 2008 season after Brodie Croyle was declared out for the season with an injury. On October 23, Culpepper stated through an email to Adam Schefter that he would come out of retirement and give the NFL another shot. On October 27, Culpepper told the Chiefs that he would not make another meeting with the team due to a "better opportunity with another team". On November 2, 2008, ESPN reported that he had agreed to terms on a two-year deal contract with the Detroit Lions and would join the team the following week. After passing a physical, Culpepper officially signed with the Lions on November 3. The Lions assigned Culpepper number 11, the number Roy Williams had worn before he was traded to Dallas on October 14. Culpepper played 4 games with the Lions before suffering a shoulder injury. On December 28, 2008, the Lions became the first team in NFL history to go 0–16. The only other teams (since the AFL–NFL merger) to have a winless season were the 1976 Tampa Bay Buccaneers, who went 0-14 (the NFL did not extend the schedule to 16 games until 1979) and the 1982 Baltimore Colts, who went 0-8-1 during that strike-shortened season. On September 7, 2009, it was reported first overall draft pick Matthew Stafford was named the starter for the Lions regular season opener against the Saints. During preseason, Culpepper had suffered another injury (foot). Culpepper said he will respect Matthew Stafford as starter. However, he said he's not against a trade. On December 14, 2009, Culpepper played in what the Detroit Free Press headlined as "Lions suffer one of their biggest defeats in history." Played in Baltimore, the Ravens won the game 48–3. In week 14, versus the Arizona Cardinals, Culpepper was benched in favor of third string QB Drew Stanton after a poor performance. On August 14, 2011, the San Francisco 49ers' head coach, Jim Harbaugh, announced that Culpepper was working out for the team on the following Monday to possibly add him to the 49ers roster. However, the 49ers opted to sign Culpepper's former Oakland Raider teammate Josh McCown instead. Culpepper also appeared in the movie 50 First Dates in the huddle and throwing a touchdown pass to Jim Kleinsasser when Sean Astin and Drew Barrymore were watching a football game. ↑ "Culpepper's adoptive mother dies at 92". National Football League. 2007-05-06. Archived from the original on 2007-06-05. Retrieved 2007-06-07. ↑ "Culpepper's adoptive mother passes away". ESPN.com via AP. 2007-05-06. Retrieved 2011-07-05. ↑ Daniels, Harriet (2007-05-06). "Emma Culpepper dies at age 92". Ocala.com. Retrieved 2011-07-05. ↑ "Culpepper, Daunte UFL Bio". Retrieved 2011-07-05. ↑ "1995 MLB Draft, 26th round". Retrieved 2013-05-29. ↑ "Daunte Culpepper Draft Profile". NFLDraftScout.com. ↑ Sports Xchange. "NFL PREVIEW: Minnesota Vikings". FOX Sports. Retrieved 2007-06-07. ↑ Sports Xchange (2005-09-01). "Vikings report: Notes, quotes". CBS SportsLine. Retrieved 2007-06-07. ↑ "Miffed Culpepper requests trade or release from Vikings". CBS SportsLine. 2006-03-08. Retrieved 2007-06-07. ↑ "Williams sparks Cats in win over Dolphins". National Football League. 2006-08-24. Archived from the original on 2007-03-21. Retrieved 2007-06-07. ↑ Keven Lerner (2006-09-17). "Culpepper's struggles". South Florida Sun-Sentinel. Retrieved 2007-06-07. ↑ "Miami's Culpepper has more surgery on knee". National Football League. 2006-11-30. Archived from the original on 2007-05-09. Retrieved 2007-06-07. ↑ Dave Hyde (2007-01-21). "HYDE: Culpepper is Cameron's top issue". South Florida Sun-Sentinel. Retrieved 2007-06-07. ↑ Greg A. Bedard (2007-04-27). "Culpepper's future with Dolphins is dimming". Ocala.com. Retrieved 2007-06-07. ↑ Associated Press (2007-06-07). "Dolphins tell Culpepper they're 'going in a different direction'". ESPN. Retrieved 2007-06-07. ↑ "Culpepper asks Dolphins to release him". National Football League. 2007-06-07. Archived from the original on 2007-06-09. Retrieved 2007-06-08. ↑ John Clayton (2007-06-08). "Culpepper changes mind; asks for release from Dolphins". ESPN. Retrieved 2007-06-08. ↑ Associated Press (2007-06-08). "Culpepper leaves practice field accompanied by security". ESPN. Retrieved 2007-06-08. ↑ Len Pasquarelli (2007-06-09). "Frustrated Culpepper seeks NFLPA union intervention". ESPN. Retrieved 2007-06-09. ↑ Cole Pepper. "Jags Out of Culpepper Hunt?". wokv.com. Archived from the original on 2007-10-22. Retrieved 2007-10-02. ↑ "Packers pursuing Culpepper as possible backup". Retrieved 2008-04-28. ↑ Glazer, Jay (2008-10-28). "Sources: Culpepper drops visit with Chiefs". Fox Sports. Retrieved 2008-10-28. ↑ "Top 100 Modern Quarterbacks: 60–41". Football Nation. July 26, 2012. ↑ Marks, Andy. "No. 1: Culpepper shines from Booster Stadium to Pro Bowl". Star-Banner. Retrieved 16 September 2011. 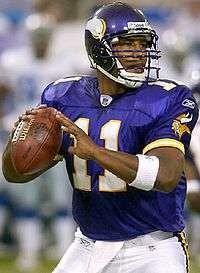 ↑ "Daunte Culpepper NFL Football Statistics | Pro-Football-Reference.com". Pro-Football-Reference.com. Retrieved 2015-04-27.